Feeling: I’m now 40 weeks pregnant and officially overdue according to the hospital’s scan dates. Little R-M does seem to be getting ready to make his or her appearance. I’ve been getting Braxton Hicks and lightning pains every night for the last few days. Little R-M is moving around a lot, especially when I settle down in the evenings. Overall I’m still feeling OK, but the tiredness has hit a new level this week. If I’ve had a busy day, then the next day is a bit of a wipe-out, so I’m trying to take it easy. I wonder if there will be a 41-week bumpdate…. Appointments: I had my 40-week midwife appointment this week. All is fine and the baby is still growing as it should be, the heartbeat is fine and my blood pressure etc is normal. If nothing has happened by Wednesday, I am going in for a sweep, then another Friday and another the following Monday. If I’m still pregnant, then I will be booked in for induction a week on Wednesday. Looking: Bump has definitely got bigger this week. Craving: Nothing much, I don’t have much of an appetite any more. Sleeping: On and off is still the best description. I’m so bunged up and uncomfortable, that I’m waking a lot, but I’m getting quite a bit of sleep in little chunks. 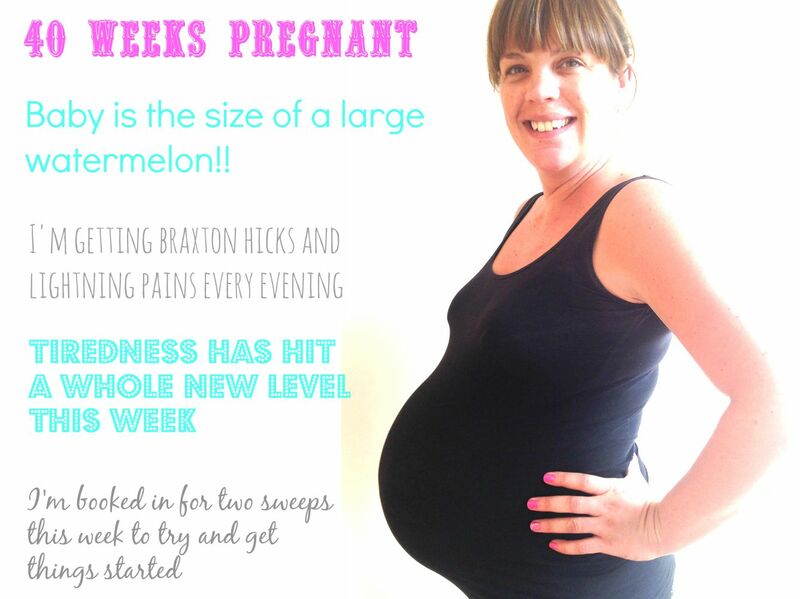 Baby is the size of: A large watermelon. Eeeeek!